Enchanted History: Crayfish and Monkeys and Dogs! Oh My! Crayfish and Monkeys and Dogs! Oh My! L.P. Hartley wasn’t wrong when he said ‘The past is a foreign country: they do things differently there’; he was just woefully understating the case. When you first encounter many aspects of early modern culture and belief systems it can sometimes be as disorienting and disturbing as passing through the looking glass, going down the rabbit hole, or being carried off by a tornado. Like Alice and her adventures in Wonderland, the unwary traveller through a topic like witchcraft and diabolism in early modern England can encounter strange new ideas and images that don’t quite make sense at first – and sometimes never do. Coming to grips with witchcraft and demonology is one thing, understanding the double entendres, in-jokes, and colloquialisms found in my source material is quite another. It leads to a multitude of baffling questions, some of which are simply unanswerable. 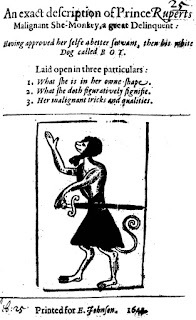 For example, why would Prince Rupert potentially be mortally offended by a the title of a pamphlet called An exact description of Prince Ruperts malignant she-monkey (1643)? And while we are on Prince Rupert, what, if any, is the connection between kissing and dog-training methods? Why would referencing a crayfish possibly be a crude joke? Is there something in the frequent references to lavish food in the major Lancashire witch trials of the early seventeenth century? caught the bullets in her hands and chew’d them. Which led Associate Professor Laurie Johnson to ask if the Prince was kissing his dog as part of inducing loyalty during puppy training? … Of course that question led to several entertaining days lost in the realm of book chapters on spit, saliva, and bodily fluid in early modern England – diverting, sure, necessary to my thesis? [vi] Sadly, probably not. This may mean a lobster or a crayfish, it is unclear. A popular seventeenth-century song related a ‘crabfish’ biting a woman in the private parts after her husband secretly places the ‘crabfish’ in their Chamber pot. See ‘The Crabfish Song’, Thomas Percy, Frederick James Furnivall, John Wesley Hales, Bishop Percy's Folio Manuscript: Loose and Humorous Songs 99-100. But I still wonder about whether or not there were connotations of drunkenness or black humour in the idea of the crabfish ‘nipping’ Elizabeth Southerne in her bed. I hope this post has suggested just a little of the humorous, unusual, and sometimes pointless research avenues one goes up in the course of writing a doctoral thesis on witchcraft in early modern England. [i] John Taylor, An Exact description of Prince Ruperts malignant she-monkey, p. 5. [ii] John Taylor, An Exact description of Prince Ruperts malignant she-monkey, p. 5. 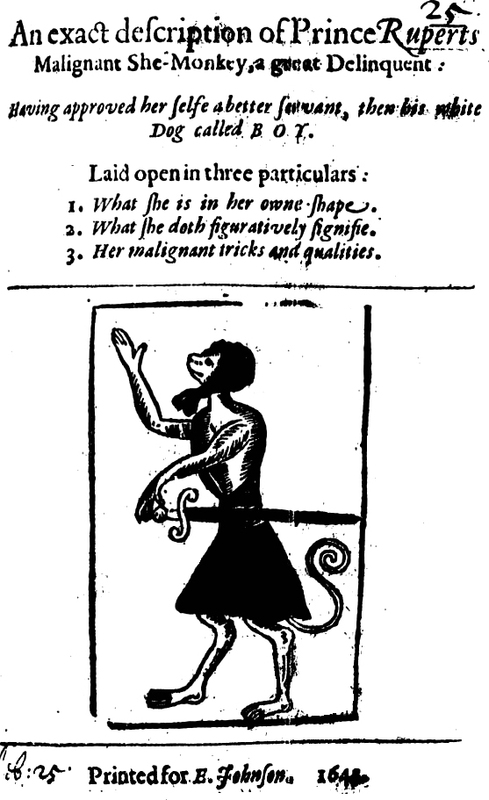 [iii] John Taylor, An Exact description of Prince Ruperts malignant she-monkey, p. 5. [iv] John Taylor, An Exact description of Prince Ruperts malignant she-monkey, p. 5; Mark Stoyle, The Black Legend of Prince Rupert’s Dog: 99. [v] ‘T.B.’ [Anon], Observations, p. 5. [vi] See for example Brett D. Hirsch “The Taming of the Jew: Spit and the Civilising Process in The Merchant of Venice”, in Rory Loughane and Edel Semple (eds), Staged Transgression in Shakespeare's England: pp. 136-52. [vii] John Cotta. The triall of vvitch-craft she the true and right methode of the discouery: with a confutation of erroneous wayes. (London,1616): p.84. [viii] British Library, Add MS 27402, fs. 111.